Since the legion of Game Awry first came to be, there has always been a tradition of playing games prior to podcasting. For the overwhelming majority of that duration, we’ve chosen The Jackbox Party Pack as our primary package of entertainment. Games such as Drawful and Fibbage have become mainstays, and with the release of Quiplash (the latest from Jackbox Games) the Game Awry crew looked to add another staple game to the weekly ordeal. Quiplash is a party game where up to eight people compete with punchlines to whatever random question that gets thrown their way. After submitting their queries, each player votes for the best answers until one is crowned in the ultimate free-for-all Last Lash of the third round. It’s semi-reminiscent of Mad Libs, and the amount of entertainment is largely dependent on the conditions you find yourself playing. Although this time around, the people at Jackbox Games decided to include audience participation to add to the madness. The inclusion of crowd interaction is especially attractive to the rising popularity of live streaming, allowing up to 10,000 members of the audience to get in on the fun. People watching can join in using the web app, and it’s compatible with a wide array of devices which allows for easy accessibility. It’s all pleasantly done, in theory, though Quiplash’s execution is a stumbling block I sometimes could not overcome. Otherwise fun topics wear out their welcome once you see them three or four times. One of the most frustrating things about Quiplash is that it comes so close to nailing something great. At it’s core, the games are fun, the setup is simple, and the interplay with others all works as advertised. Yet all of the multiplayer functionality is steeped with huge technical oversights. For starters, the only person who can begin a game is the first player to join the room. Which is incidentally a huge problem for a party game that also encourages online play. On several occasions, I had to back out and quickly enter a short name just so I could start my own game. It’s unfortunate, not only because the first guy in the room controls when we start the whole show, but there is also no way to manage players. In fact, online players would hop in and fill the room before people IN MY HOUSE could join, and the only option to remedy that was either exiting and restarting the game (potentially repeating the problem) or stopping the stream altogether. On top of that, Quiplash does not seem to keep tabs on any of the prompts it tosses up, so through six long sessions we’ve already seen several repeats. It’s a bummer, because there really isn’t much fun to seeing the same jokes over and over again and there should be no shortage of variety given that this is a standalone title. Adding to that, the game requires two screens/windows for participants who aren’t participating locally. I don’t think that’s a huge issue, but since one of the only things not being displayed on your browser are the results, it feels like a pretty significant design flaw to overlook. If Quiplash were a single screen experience, it'd be much easier to get new people in on the action, and would likely benefit the people who worked on the game along with the players using it. PTA Dad is not the guy you want crashing the party. All-in-all, Quiplash is fun, but even more fun if you can fill a room and get some people to hop in to make votes. However, I can’t help but feel like Jackbox Games dropped the ball short of making something that could’ve been a weekend classic. 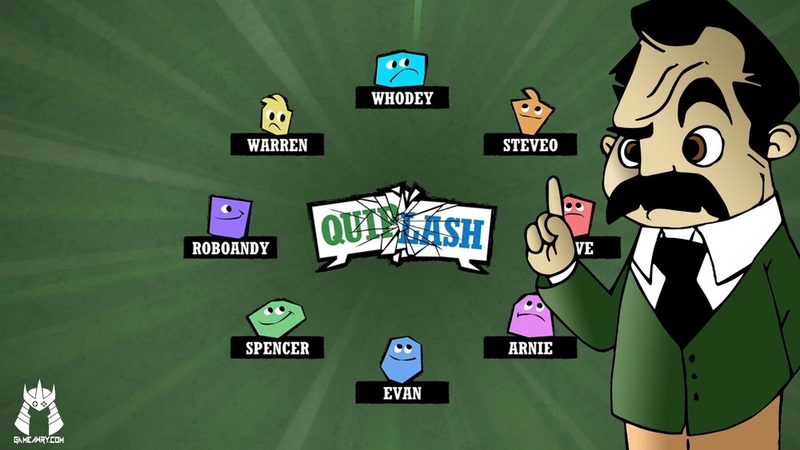 Most of the issues in Quiplash aren’t present in many of their previous titles so it’s curious to see them pop up now. The tools for getting people involved work but aren’t very friendly for the people controlling the game nor the people participating online. These issues stick out like a sore thumb and tend to hamper what should be a great time. In the end, I was sad to award Quiplash a PTA Dad on the Game Awry Review Scale. Quiplash is a fun party game, but totally flawed. The good news is that most of the problems could be fixed in a future patch, but there’s no telling if we’ll still be playing it by the time it gets ironed out.